Compete in the Costa Rica Lacrosse Federation’s annual summer tournament against the Costa Rica national team and other visiting teams from the U.S. Spread the game of lacrosse by running numerous clinics for elementary school children in Playa Samara. Participate in painting and construction work projects with our 501(c)3 partners Student Cultural Exhange and Asociacion CREAR. Hands-on experience learning the significance of living a socially conscious life and how to positively impact the world. 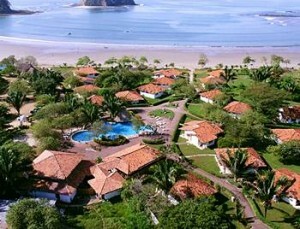 Of course, this is Costa Rica! Surfing (with optional lessons), canopy tours, beautiful hikes, beach BBQ’s, and much more! 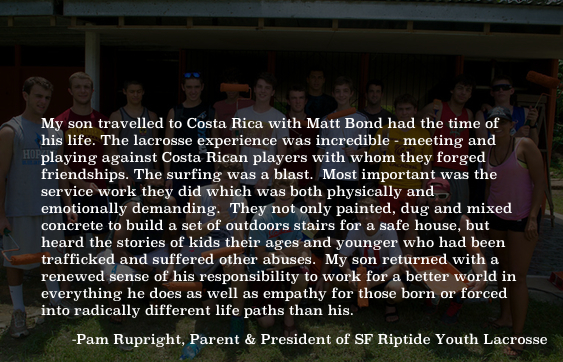 This trip is open to high school & college aged boys and girls who have a desire to play lacrosse and serve others in a cross-cultural environment. Additionally, applicants should have a demonstrated history of maturity, leadership, service, and ability to interact positively in a dynamic team environment. Preference will be given to upperclassmen. Interested players should download, fill out, and send in the trip application. Applicants will be contacted to schedule an interview. Trip Cost is $3,950 – All-Inclusive in-country includes 11 days, 10 nights lodging, airfare, meals at hotel, ground transportation, travel insurance, surfing lessons, surfboard rental, local guide staff, and more. We’re partnering with Piggybackr.com to enable trip participants to raise necessary funds. Piggybackr allows participants to fundraise via email, social networks, text messages, and good old fashioned phone calls. Please click HERE to see the SixFifty Piggybackr site For questions and more information, please email Matt Bond at mtbond@jhu.edu. Near the center of the village of Samara, the Tico Adventure Lodge is just 100 yards from the beach and a short walk to restaurants and services. The Lodge has a pool, game room, and restaurant. 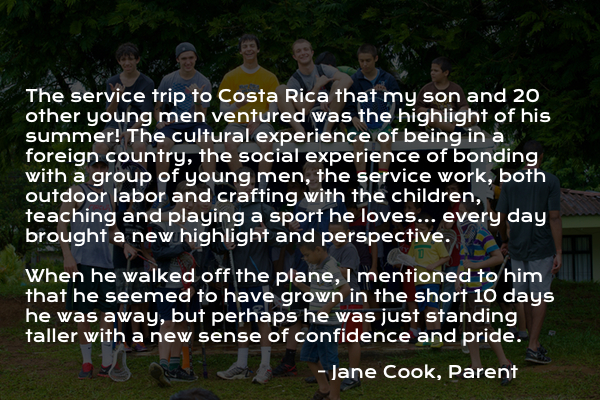 You can learn more about the Tico Adventure Lodge by clicking HERE. Located on the Nicoya Peninsula in the Northwest of Costa Rica, Playa Samara is an idyllic and inspiring tropical setting with ocean water temperature around 85F. Nestled between the clear blue waters of the Pacific Ocean and lush, jungle-covered hills, Samara is a vibrant and tranquil community that travelers always fall in love with. You can learn more about Playa Samara by clicking HERE. The mission of Student Cultural Exchange is to provide immersion-based travel opportunities that help transition eager young minds into caring, socially conscious global citizens. Their varied program options are designed to give American and international student travelers the opportunity to develop deep, lifetime connections with previously unknown people and places. By exposing student travelers to positive experiences and role models from around the world, Student Cultural Exchange aims to affect gradual, deep-seeded change in students’ world view and understanding of the diverse paths available to them on life’s journey. Student Cultural Exchange is built on the premise that this sort of influence is not only possible, but essential to a young person’s development and growth. You can learn more about Student Cultural Exchange by clicking HERE. The mission of La Asociación CREAR is to provide supplemental educational, recreational, and career opportunities for community members, primarily youth with limited resources, in the rural beach communities surrounding Playa Sámara in Guanacaste, Costa Rica, by offering a wide variety of innovative programs focusing on academic and artistic education, environmental consciousness, health, and socio-cultural development. You can learn more about Asociacion CREAR by clicking HERE. Drop us a line with any questions you might have!